This semester, Drs. Jessica Hokamp and Maxey Wellman have introduced an activity into their cytology elective course that both anticipates increased future application of technology in general practice and supports student ability to identify the ideal area on a lymphoma slide for diagnosis. 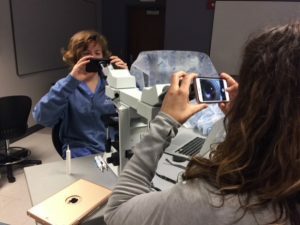 Some practitioners are sending cell phone images to pathologists for diagnosis, and their activity asks students to effectively use the microscope, identify areas and cells being viewed, and capture the area identified using the iPhone. Pictured are students attempting the capture. Drs. Hokamp and Wellman plan to refine the pilot learning module into a teaching and learning research project. Posted by Melinda Rhodes-DiSalvo at 10:05am July 2, 2018 Posted in Teaching, Teaching: Learning Technologies and tagged Showcase. Bookmark the permalink.